The Notorious Meddler: "Sustained by God's Gace"
Mary Bowlin's story surrounding the discovery of her brother Joe Elmore's remains is one of faith, hope and courage, and belief in prayer. It is a testament to how God's grace sustains us. Just like Pauline Conner, who had prayed for twenty-two years that her late husband, 1st Lt. Garlin Murl Conner, would receive the Medal of Honor seventy-three years after his heroic efforts during WWII, Mary prayed for 68 years that her brothers remains would be found. Both women were warriors far superior to any epic hero. Sustaining grace is described as grace given at special times of need, especially during adversity or suffering. The dictionary definition for grace is unmerited divine assistance. Isn't it awesome that God desires to do that for us? Grace is clearly expressed in the promises of God revealed in Scripture. (from the article "Grace" at faiththeevidence.com. "As for me, I will call upon God; and the Lord shall save me. Evening, and morning, and at noon, will I pray, and cry aloud: and he shall hear my voice. He hath delivered my soul in peace from the battle that was against me: for there were many with me. 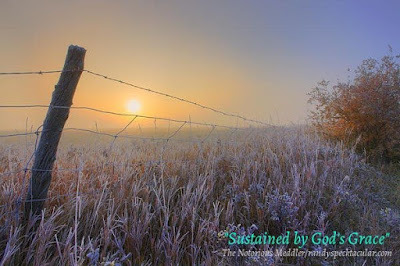 Cast thy burden upon the Lord, and he shall sustain thee: he shall never suffer the righteous to be moved." Psalms 55:16-17, 22. The good news is that God is in the business of giving fresh starts to people. He gives hope to the hopeless. Direction to the directionless. Help to those who need help. God is always good, all the time, and God’s plans will always prevail, even when our plans don’t. (from the article "Grace" at faiththeevidence.com. Evangelist Billy Graham once said, "The will of God will not take us where the grace of God cannot sustain us." Through it all, Mary and Pauline found God's sustaining grace. They prayed unceasingly, always beseeching God’s help and His mercy, and their prayers were answered. Both women are true testaments to what pertinacity, patience and prayer can do for us. Their stories are proof that we should never give up and we should certainly never stop praying. God works all things together for good for those who love Him. He hears our prayers and will provide all our needs in His time and according to His will. While researching for this story, I came across a word that perhaps is not used in most folks' everyday vocabulary. That word is Pertinacity. It describes a quality of sticking with something no matter what. It's called persistent determination. People who have pertinacity won't give up. They stick with things doggedly. Pertinacity is a mix of courage and conviction. It requires a strong will and self-confidence. Pertinacity can also be called perseverance and resolution. It requires forbearance and a willingness to endure emotional pain and suffering. Mary and Pauline were delivered by God's sustaining grace.